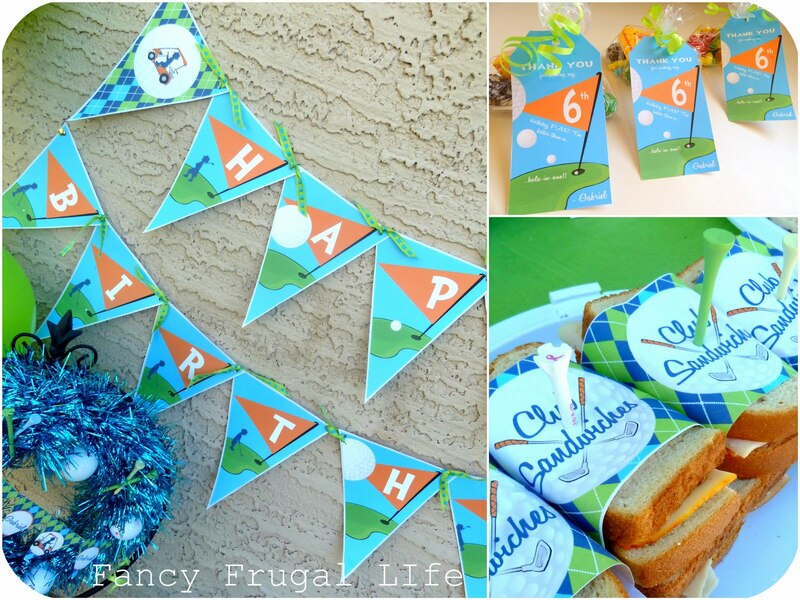 This weekend we hosted my son's class to a picnic in the park birthday "Par-Tee". It turned out super cute and we all had a great time. My son was especially proud of the entire party...(heart is happy! ).The weather was sunny and perfect, (thank goodness)! 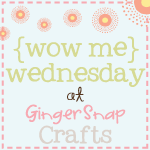 cupcake toppers, and food labels!! I made these golf silhouettes with foam poster board and thick paint pen. 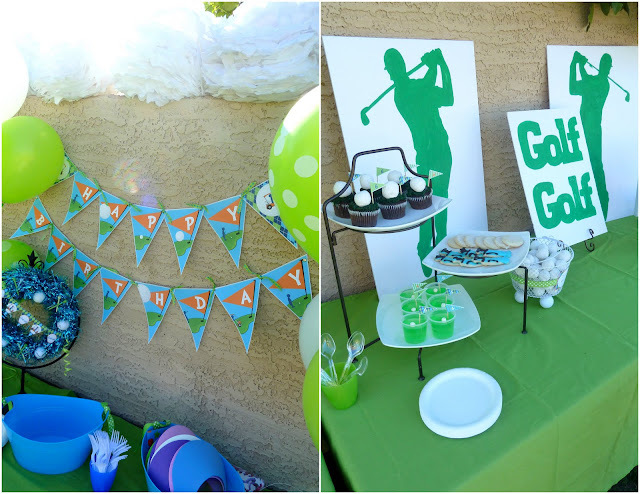 My brother had the golf guy and golf sign (from Hobby Lobby) that are actually wall decor. I just traced them on the poster and colored in with the paint pen...SO easy and festive! Also, I found green linens that were the perfect color at Goodwill for under $5 a tablecloth.... Score! Here I enlarged one of the invitations designed by Gwynn and made a pedestal frame. I make those from a thrift store frame & candlestick spray painted white and glued together. 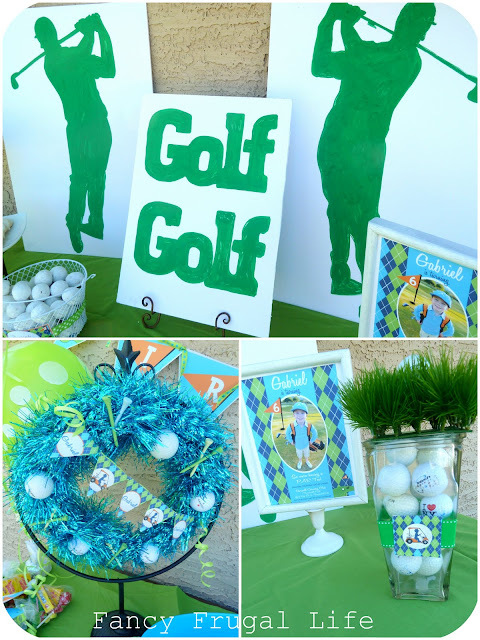 Golf balls (mine are from Goodwill) make a great centerpiece in a glass vase and faux grass. And here's the golf wreath made out of left over Christmas tinsel. tees, and balls. I ordered the cupcakes at Fry's grocery and had them pipe frosting to look like grass. Then I added a donut hole and flag. I found this idea via pinterest from this gorgeous party. 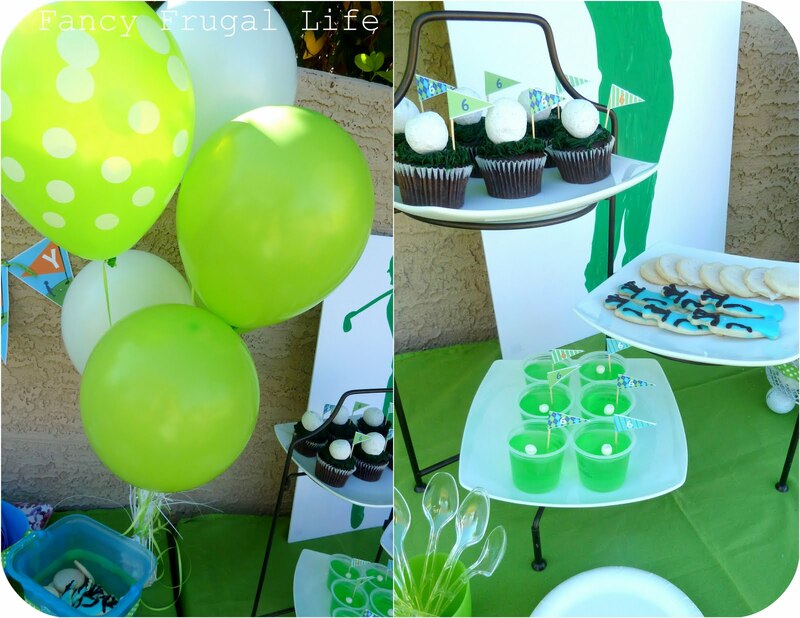 The green jello cups were actually my idea though! Ha. I added a flag and rolled mini marshmallows to look like a tiny ball. 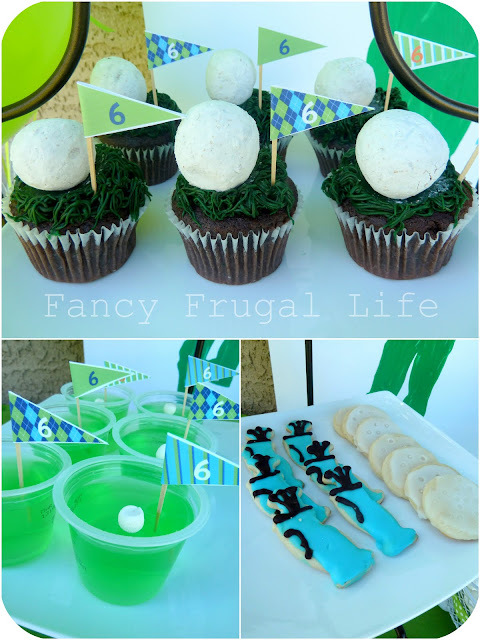 Here's my best attempt at sugar cookie golf bags and balls. The golf bag cookie cutter was $0.60 at Sur La Table. 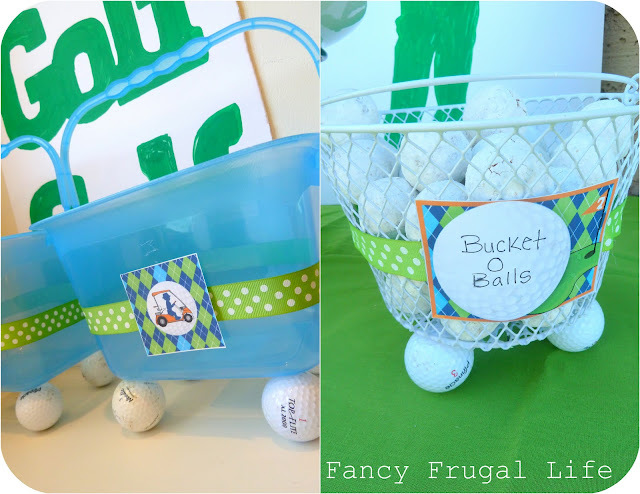 Here's a bucket of balls (donut holes) and a couple other buckets (from $1 store) I used to hold snacks. 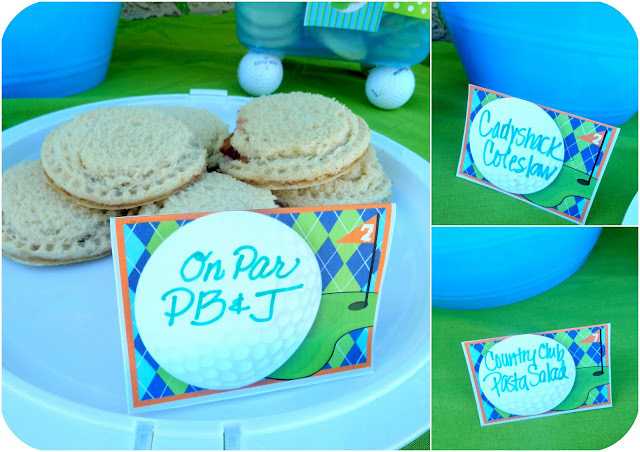 I made "On Par"PB&J's for the kids with my new sandwich press from Pampered Chef! (A cool present from my MIL). It makes them look like Uncrustables! We also had "Caddyshack" coleslaw, and "Country Club pasta salad"...I love the corny names..So did the parents :) Speaking of parents...the dads were especially impressed and now want a golf party...Ha! 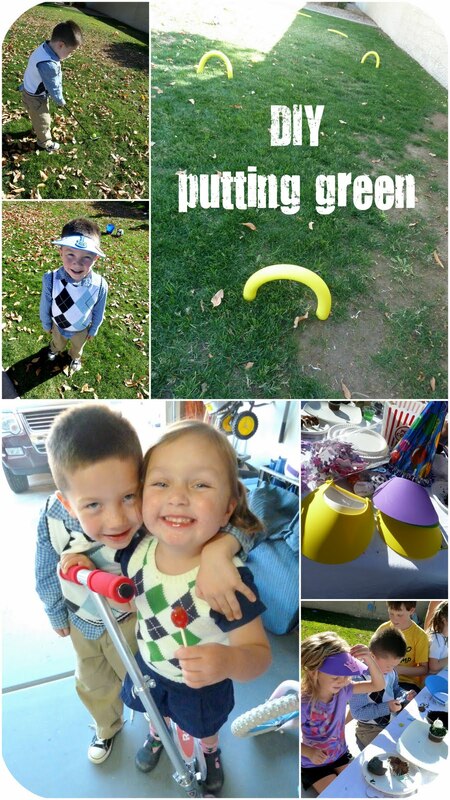 I found some random materials at Goodwill to make a little putting green for the kids. We also decorated foam visors. They were a big hit! And now after Christmas, Disney, and this party I am spent, tired..exhausted....I need long nap :) Thank you so very much for stopping by. Do have a wonderful day! I am dying over HOW CUTE all of this is!! I'm pinning this for sure! oh my goodness, this is fabulous. i love the jello cups and bucket of donut holes! so many great ideas. Oh you should be exhausted!!! The cutest thing every, from the argyle sweaters to the doughnut hole cupcakes! I can see why the big boys (Daddy's) want a golf party of their own!! 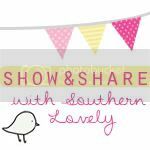 Tons of fabulous ideas! You asked if I had seen the rhinestone or jewelry pin bouquets, I had seen them, but the flower bouquet was something new to me, of course I don't spend hours like a bride to be googling wedding stuff LOL! I am getting such a kick out of the vintage wedding trend...Lovin it too! Now, you go rest you have out done yourself! The argyle pattern is perfect! Both on the printables and on those little golfers' vests! 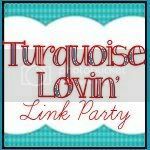 Adorable party... love every detail! 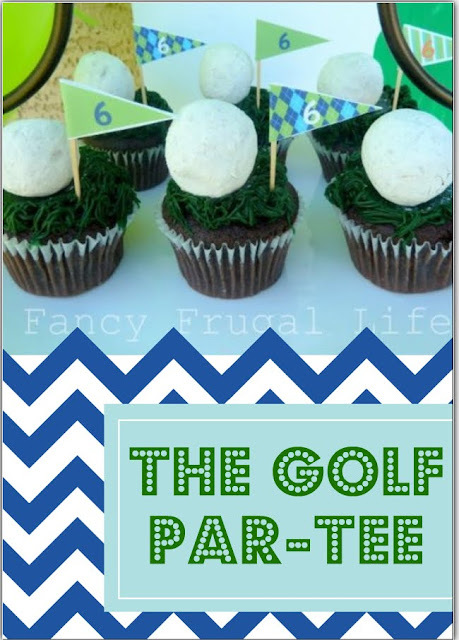 I am so happy you linked up your Golf Par-tee. When I saw you post it the other day I thought it was SUPER CUTE! I love the sweaters and the wreath, the printables are adorable but maybe my favorites are the jello and cupcakes. Great color combo too! Visiting from Tip Junkie...love it! Par-Tee...hahaha so cute. serious yum going on here. par-tee on! Those jellos are a crack up! Great theme.